One of my 8th great grandfathers was Ichabod Chauncy (1635 -1691), a Dissenter and Puritan, whose father, Charles Chauncy (1592-1672), was a long-serving President of Harvard College. Charles Chauncy graduated at Cambridge in 1613, and became a fellow of his college and a professor of Hebrew and Greek. In 1627 he was appointed Vicar of Ware, Hertfordshire, and from 1633 to 1637 he was vicar at Marston St Lawrence, Northamptonshire. Chauncy had Puritanical opinions that placed him in opposition to the church hierarchy, including its most senior member, the Archbishop of Canterbury, William Laud. He asserted in a sermon that “idolatry was admitted into the church” and he opposed, as a “snare to men’s consciences” placing a barrier – the altar rail – around the communion table. He was suspended by Archbishop Laud for refusing to read from the pulpit the “Book of Sports”, which set out permissible Sunday recreations. He was brought before the Court of High Commission in 1629 and again in 1634. In 1634 he was imprisoned. He made a formal recantation in 1637 (which he later regretted). In 1638 Charles Chauncy emigrated to America, and from 1638 to 1641 he was an associate pastor at Plymouth, Massachusetts. However, the Plymouth church community was dissatisfied with his advocacy of the baptism of infants by immersion. From 1641 to 1654 he served as pastor at Scituate, Massachusetts. From 1654 until his death in 1672 Charles was President of Harvard College. Charles Chauncy and his wife Catherine Chauncy nee Eyre (1604-1667) had six sons and at least two daughters. All six sons were said to have been “bred to the ministry and graduates of Harvard”. Ichabod was the third child and second son. The unusual name ‘Ichabod’ appears to be an allusion to an Old Testament story. In 1 Samuel 4, the Philistines defeat Israel and capture the Ark of the Covenant. At this news the wife of the high priest Phineas falls into labour and gives birth to a son whom she names ‘Ichabod‘, conventionally translated as ‘the glory has departed’. Charles Chauncey was very likely giving expression to his rather strong opinion of the the lapsed and degenerate state of the Church of England. Ichabod was brought to Massachusetts in 1638, when he was about three years old. In 1651, at about the age of 16, he and his older brother Isaac graduated from Harvard College. Returning to England Ichabod Chauncey became an army chaplain to Sir Edward Harley’s Regiment at Dunkirk. However, in 1662, at the time of the Act of Uniformity, Ichabod was one of some 2,000 Puritan ministers who were forced out of their positions by Church of England clergy, following the changes after the restoration to power of Charles II. The Act of Uniformity prescribed that any minister who refused to conform to the Book of Common Prayer by St. Bartholomew’s Day (24 August) 1662 should be ejected from the Church of England. With his clerical career at an end Ichabod took up the practice of medicine. On 13 October 1666 he was admitted an Extra-Licentiate of the College of Physicians. 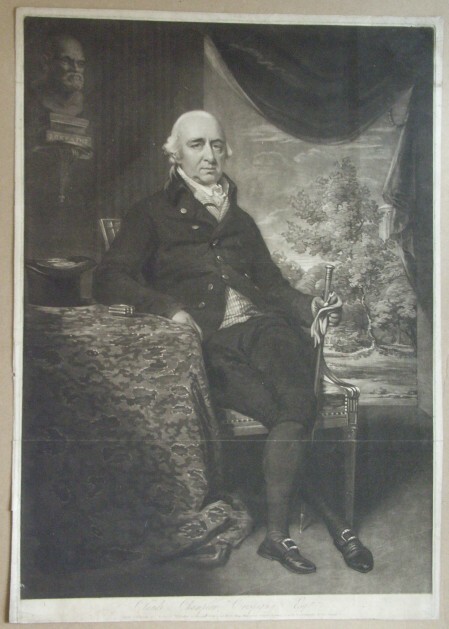 He settled at Bristol, Gloucestershire. In 1682 Ichabod Chauncey was prosecuted for not attending church and was convicted and fined. In 1684 he was again prosecuted, imprisoned for 18 weeks, and was sentenced to lose his estate both real and personal, and to leave the realm within three months. He went to Leiden, Holland,and practiced as a physician there until 1686 when he returned to Bristol. There is a suggestion that Ichabod’s persecution may have originated in the private malice of the Bristol town clerk. Ichabod Chauncey died at Bristol on 25 July 1691 and was buried on 27 July at St Philip’s Bristol. Munk, William. “Ichabod Chauncey.” Munk’s Roll Details, Royal College of Physicians, munksroll.rcplondon.ac.uk/Biography/Details/828. John Langdon Sibley (1642). 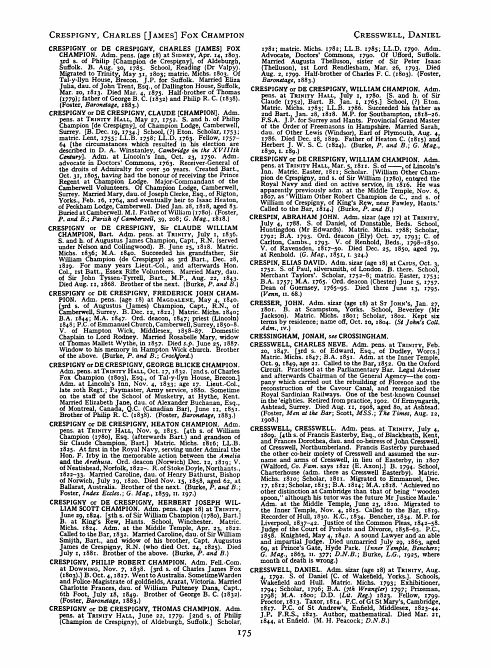 Biographical Sketches of Graduates of Harvard University, in Cambridge, Massachusetts. Johnson Reprint Corporation. pp. 308–9. 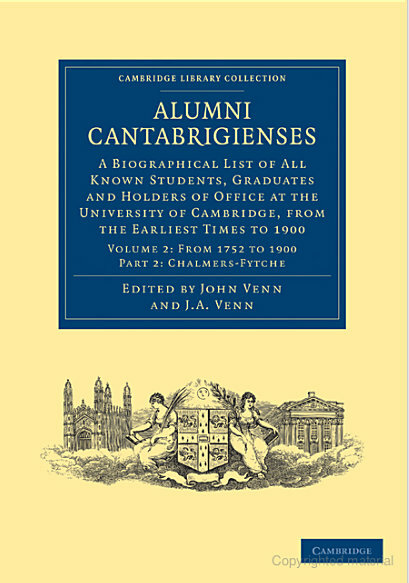 Alumni Cantabrigienses: A Biographical List of All Known Students, Graduates and Holders of Office at the University of Cambridge, from the Earliest Times to 1900 includes eleven members of the Champion de Crespigny family. 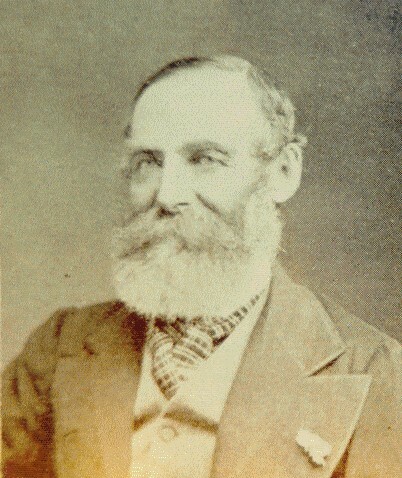 The book is partially digitised on Google books for sampling and the relevant page for the Champion de Crespigny family (page 175 of volume 2) is included in that digitisation at http://books.google.com.au/books?id=-FjmQ4xTgkQC&pg=PA175 . 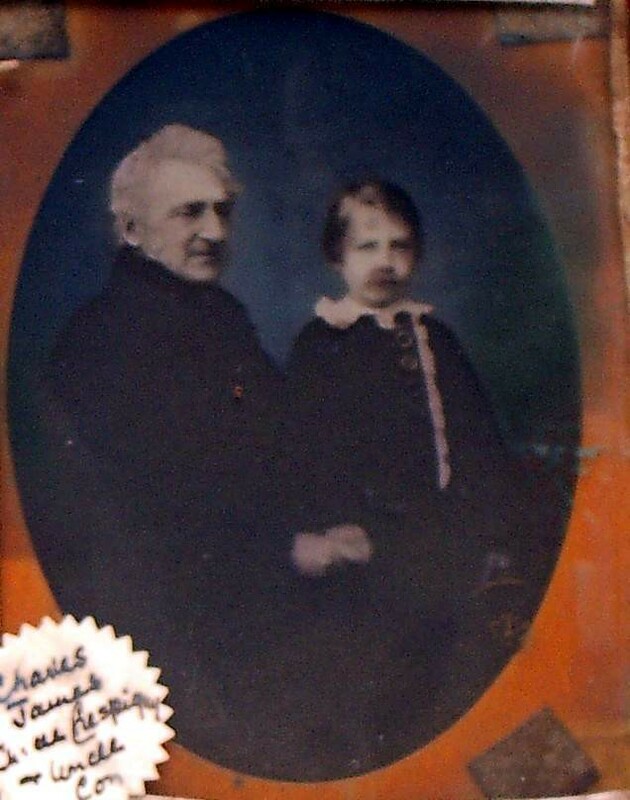 Ancestry.com have similar, but not always identical information in their database: Ancestry.com. 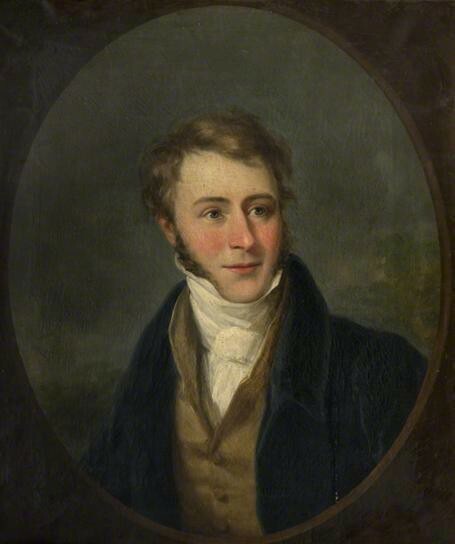 Cambridge University Alumni, 1261-1900 [database on-line]. Provo, UT, USA: Ancestry.com Operations Inc, 1999. Of the colleges, Trinity Hall was the most popular with six members of the family attending. Three attended Trinity College. Other colleges were Downing and Magdelene and Sidney. 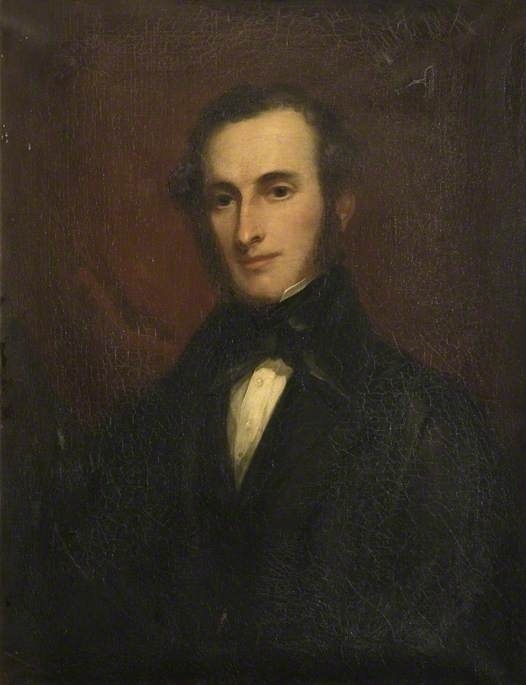 Claude William (1818-1868) the third baronet, great grandson of the first baronet, grandson of the second baronet. 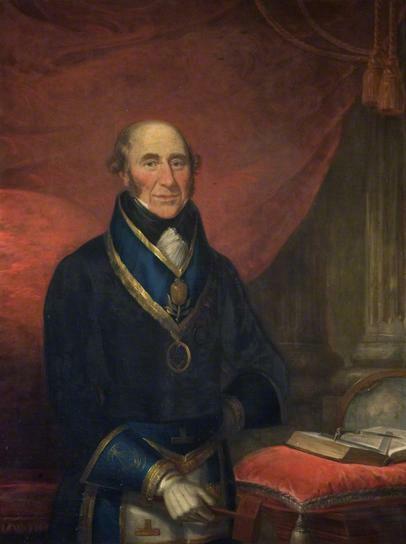 Sir William Champion de Crespigny (1765–1829), 2nd Bt by Philip August Gaugain Oil on canvas, 121 x 94 cm Collection: Kelmarsh Hall (my first cousin six times removed).